It pains my heart when I see an amazing horror game experience not receive the success that it rightfully deserves, whether it be critically, commercially or financially. Besides the fact that is takes a grand effort on all fronts to even produce and put out a quality horror video gaming experience, it hurts my feelings when something truly amazing comes along, and it barely makes a blip on the gaming landscape. There is one game that I feel best exemplifies this unfortunate circumstance. It had an amazing E3 2017 reveal trailer that was met with positive notices and was punctuated by its official release date of October 13th 2017….on a Friday…which is a Friday the 13th! It was an amazing reveal, and the subsequent advertising kept the hype alive all the way until the fall. Then it came out, and before you knew it, it was already being discounted by half on Thanksgiving weekend and was met with general disinterest. After buying this game on release day, and playing through it completely in a few weekends, I find this to be a crime against the horror world at large. The title I speak of is Bethesda’s The Evil Within 2, the sequel to the successful survival horror adventure that was released in October 2014. This game should really be considered a masterpiece by anyone with an inkling of horror interest. The Evil Within 2 continues the adventures of Sebastian Castellanos, the Krimson City detective from the original entry. After experiencing the horror and psychedelic nightmares that he encountered during the Beacon Hospital incident, Sebastian is now a drunk, out-of-work washed up has been. No one believed him about what had happened at the hospital, and he has been content to just waste his life away at the local pub. However, the return of his former partner Juli Kidman, who we learned in The Evil Within was actually a double agent who worked for the company responsible for the Beacon disaster, MOBIUS, leads to a revelation about a tragedy from his past. Sebastian’s daughter, Lily, who was thought to have died before the events of the original game in a house fire, is actually quite alive. She’s is currently living within a new iteration of STEM, the mysterious science project that was the main culprit of the original’s trippy locations and monstrous creatures. Lily has turned out to be the perfect individual as the main core of the new STEM and she has in turn manifested and created a perfect central location for everyone who jacks into her mind, a city called Union. However, Lily has now gone missing within the world she has created, and Sebastian is the final ditch effort by MOBIUS to retrieve her before the entire system collapses, and a chance for Sebastian to redeem himself and not lose Lily for the second time. This is the final stand for Sebastian to salvage what is left of his existence. The original Evil Within was released for the PS4, XBONE, PS3, XB360 and PC back in October of 2014, and was presented to the public as a major horror gaming event. This came from the newly created developer Tango Gameworks, which was started by legendary developer Shinji Mikami, the legendary creator of Resident Evil, the originator of the survival horror genre. Upon its release, the general reaction was that this was an epic horror adventure that lived up to the hype. My personal take on this game is that it’s the horror game that utilizes the “throw everything and the kitchen sink” approach to its entire existence. Mikami threw so many wild ideas, gameplay sequences, trippy visuals, complete world distortions and a multitude of monsters and massive grotesque bosses at the player, it literally became overwhelming in the best way possible. This game created so many memorable monsters that still resonate today, such as the Samara-like multi-limbed demon creature Laura and, probably the most iconic, The Keeper, a large burly Leatherface type madman with a large combination safe as its head. The game was originally being developed for the PS3/360, but since this game came out around when the PS3/360 generation of consoles was laying to the wayside for the newer brethren of the PS4/XBONE, it was also ported to the newer systems to maximize sales and exposure. Unfortunately, since this was designed on older hardware at the time it came out, the game tended to look a little washed out, grimy and was littered with slowdown and graphical pop-ups throughout the 10-15 hour journey. In the end, those detriments didn’t affect the game as a whole. This horror journey was epic. The Evil Within 2, right from the start, was a graphical beauty and technical marvel. This was being created during the peak time of a hardware generation, which is about two to three years in. This is when developers have a good handle on the architecture of each console and are able to, if they are competent enough in their technical prowess, harness the power of the hardware to its maximum potential. The trailer from E3 2017 aptly presented what needed to be shown, revealing the general plot, showcased new locations and enemies, displayed the graphical upgrade, and effectively sold the atmosphere. The entire trailer was set to a cover of the classic Duran Duran song “Ordinary World”, and was incredibly spot on in delivering the mood and atmosphere that Bethesda wanted to convey. Expertly directed by John Johanas, who directed the original’s DLC that revolved around Juli Kidman, this 15+ hour journey was such a sweeping and epic tale of loss and redemption, all sprinkled with some of the most gruesome and vivid horror imagery to ever grace a video game. There was never a dull moment, including multiple side missions, creative boss battles, intriguing and varied locations, and a quite surprising twist hat changed who the big baddie of the game was midway through your adventure. 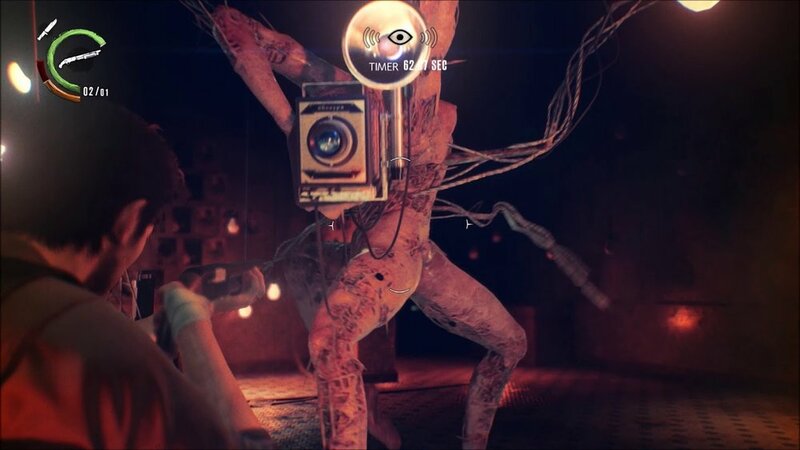 Memorable characters created for this entry include the demented photographer Stefano Valentini and religious zealot Theodore Wallace, and even monstrous menaces such as the slinky hyper-sexual “body with a camera face” Obscura or the mannequin abomination with multiple arms and heads, named the Guardian. The Evil Within 2 contained everything that was amazing and awesome about the original, but added a legitimately impressive graphical engine to further sell the environments and atmosphere, smoother gameplay overall and a more cohesive story experience for the player to follow, as opposed to the original’s convoluted plot that included mass insanity around every corner. I simply adore this superior sequel and completely ready to dive back in for my 2nd playthrough any day now. So, why did this game not succeed? Allow me to provide reference for this question. The Evil Within ended up recording the highest first month sales for a survival horror game…ever….even more than Resident Evil. It sold around 4+ million copies and finished #3 on the NPD results for October 2014. The Evil Within 2, however, ended up selling only around less than a million copies in its first month of release, landing at #13 on the NPD results for October 2017. I really can’t explain what happened between these two games that the sales dropped so dramatically. EW1 was released a year after the PS4/XBONE released, with the old PS3/XB360 still active, so it had the advantage of releasing across four platforms (plus PC). EW2 was in the middle of the current generation of gaming, so it was developed exclusively for only two platforms (and PC, of course), inherently hindering sales comparisons to the original. Even so, the increase in graphical and audio fidelity and overall quality in relation to story and gameplay should have easily drawn in the fans of the first one and brought in the rest of the survival horror community in tandem. Unfortunately, the survival horror fans and the EW1 players didn’t follow suit and get behind this amazing entry in the horror gaming universe, and it literally pains me every day. The purpose of this article is to put out the message to all my fans of horror movies and video games. Purchase The Evil Within 2 now. I don’t care what you are doing now, drop it, slap on your shoes and get over to the mall and pick up one of the best horror games of the past few years. If you don’t want to leave the house, just hop on your system’s digital store and get it there. It doesn’t matter. This is a lengthy and emotional journey that takes you to the depths of madness and insanity, with emotional depth to boot. In the past few years, I have loved Resident Evil 7 and the remake of Resident Evil 2, but The Evil Within 2 is the most criminally under-appreciated horror game in that time, and is honestly probably the most impressive of them all. My last words go to Bethesda and Tango Gameworks, the publisher/developer of The Evil Within 2….Where is my new story downloadable content for EW2? The first one had three great DLC’s, and we have gotten exactly NOTHING from the sequel. It’s time to change that now. I will just sit here on my couch and wait for that announcement..